I previously shared here how one change I made to my running in 2018 was fueling with whole foods versus gels. I started this change early in the year and tested it throughout an entire training cycle and goal race. 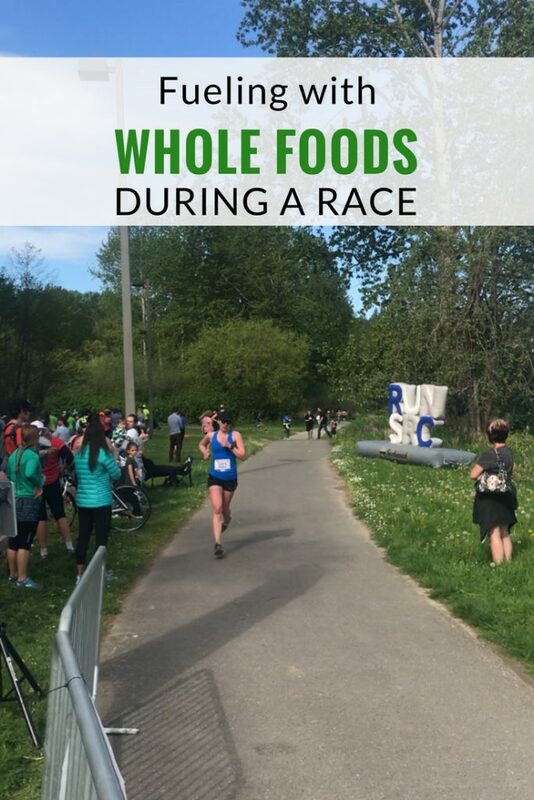 I want to share how fueling with whole foods during a race played out since we all know that training and race day can be two different stories when it comes to fueling. When I began using whole foods for fueling during long runs, I had some reservations about using them on race day. Would the higher effort level lead to GI distress or make it too difficult to chew? Would whole foods be inconvenient to carry? A whole food option worked surprisingly well for me for race day: I did not experience any gastrointestinal distress, I had an easy time eating during the race, and I felt energized without any spikes or crashes. Best of all, I finished without sticky fingers or sugar-coated teeth due to eating a gel. This post shares my experience; what works for you in fueling may differ. You might not have a problem at all with gels. 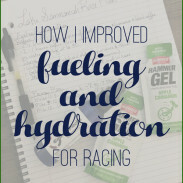 Many runners I’ve spoked to express interest in alternatives to gels, which is why I am sharing my experience. I opted to switch from gels to whole foods for a variety of reasons. First, gels can cause GI discomfort and distress, due to the large amount of highly concentrated carbohydrate (from gut-bomb sources such as maltodextrin and fructose) hitting the gut all at once. Second, I personally feel like I run best with a combination of macronutrients, including carbs and fat, rather than solely carbohydrates. And finally, gels taste gross and the texture is off-putting. I used Honey Stinger Gluten-Free waffles for this experiment. The gluten-free option was simply due to texture; I found that the regular option crumbled easily, while the gluten-free held up better on the run. Choices abound both in terms of products and recipes for whole foods fueling options, so by no means is this product what you should use. This is simply what worked for me; I enjoyed the taste and texture and noticed a positive impact on my energy without upsetting my stomach during long runs. During my long runs, I trained my gut to handle whole foods while running at race pace. My peak long run was 4 x 2 miles at goal race pace (13 miles total), so I took a quarter of a waffle during each of the intervals to practice eating at that effort level. Unlike gels, whole foods don’t come with clear “eat every 45 minutes” instructions (which are already generalizations – how often and how much is based on weight, race distance, and other goals). You need to do a small amount of math to figure out exactly how much you need to eat. I used the formula Stacy Sims shared in ROAR: 1-1.1 calorie per pound of bodyweight per hour of activity. In training, I don’t eat on runs shorter than two hours, but racing on a higher amount of carbs has always worked well for me. For half marathons over 1:20-1:25 (which I am clearly nowhere near), the energy boost that carbs provide will improve performance. I estimated my finish time based on my training at ~94-97 minutes, so I calculated my fueling needs based on that. I ended up dividing my calories up immediately before the race and during the race. Figuring in the time for carbs to hit the bloodstream, I ate about a quarter of my calories before the race (so the energy would hit in the early miles) and the remainder during the race. On race day, I frontloaded my fueling so that I did not have to chew when my breathing was very labored (the final ~3-4 miles of the race). Whole foods can take a bit longer than gels to digest, so I also wanted to ensure the carbohydrates were actually absorbed into my bloodstream by the final few miles. I figured this process would take at least 20 minutes, so I didn’t want to take anything after the hour mark (~8.3 miles). I took ~⅓ of a Honey Stinger waffle approximately 15-30 minutes before the race to top off my tank. For the race itself, I broke waffle into four pieces and tore an opening in the wrapper, so I could easily grab a piece during the race. I ate a quarter each at mile 4, 5, 7, and 8 (~29 minutes, 36 minutes, 50 minutes, and 58 minutes). My energy was high and stable throughout the race and I did not experience any fade in the final few miles. I finished with a 3+ minute PR – 1:34:57; while a variety of factors including training, smart pacing, and mental strategy led to a PR, I do believe that optimal fueled aided in running a strong race. 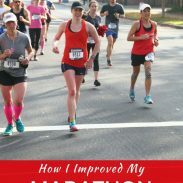 My stomach felt great – better than it had during any race in a long time – and my appetite recovered better after the race. 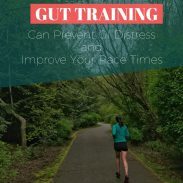 Usually, I dealt with an upset stomach and lack of appetite after marathons and half marathons, even if I made it through the race without any GI distress. I did not experience any hydration issues or the sensation of a dry mouth (I drank Nuun at every aid station except the final one). Honestly, I do not think that I could go back to using gels, at least at this point. I know that sports specific nutrition can be an evolving experiment, so that may change, but for now, I’m really pleased with how well fueling with whole foods on race day worked. Interested in optimizing your race day fueling and trying whole foods? Sign up for my Fuel Your Fastest Running E-Course – the second iteration of this four-week video course launches on Monday, June 18th. What is something you have changed that benefited your running? Would you consider racing with a whole foods nutrition strategy? Interesting tidbit about the gluten free waffles. I’ve tried to use the waffles before but the crumbling factor turned me off. I ended up not being able to eat much of it. I’ll have to try the GF ones! I usually think GF would be more crumbly, but these ones surprised me! They hold together much better than the regular ones. So glad this worked for you! Its good to know that the GF waffles don’t crumble as much as the regular ones. It actually sounds like eating the waffles this way may be easier than gels. I hate having to open the packets and try to squeeze out the gel. It was a much simpler process to just grab a piece and not mess with a gel packet, especially on some colder long runs when my hands go numb. And it was far less messy – no sticky fingers! I’ll be running my second marathon next year. My first was this past November and gels gave me GI troubles. I’d like to go to whole foods for the next one. Would you stick to the waffles for a full marathon as well? Good luck on your second marathon! I probably would stick to the waffles for the full marathon as well – they give a good boost of energy. I have thought that dried fruit would be a good compliment to them for longer distances, so that is something I would consider doing as well. I use the apple sauce and baby food twist open packs. Is that weird? Maybe. Personally, I have thought about this option, as well. Not only the applesauce, but the veggie pouches, too (but that could be too much fiber to process while running….). How many do you carry for your runs? Not weird at all – those are great sources of fuel and convenient to carry! The banana chip recipe in Run Fast, Eat Slow is supposed to be a good one – I think they’re easier to chew than the very dry ones at the sore. Those could be really good! I’ve also heard that PB stuffed dates are a popular fuel choice.